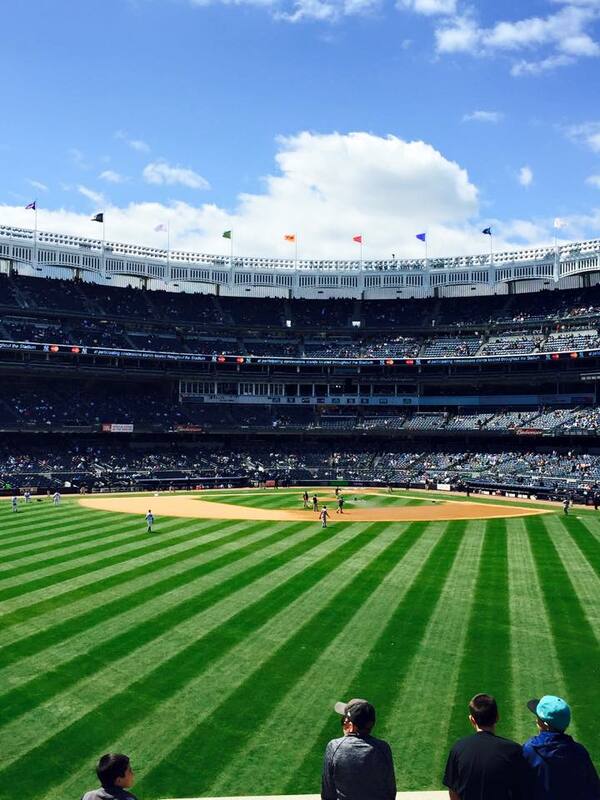 This past weekend I rolled out with The Student Events Board (SEB) to attend the Yankees vs. Red Sox baseball game. SEB puts on a bunch of different activities throughout the year and a portion of them are trips to various parts of the eastern seaboard. So when I saw that I could go to Yankee Stadium for $10 to watch the Yankees take on my beloved Red Sox I jumped at the chance. What is important to note is that like anyone that grew up in Massachusetts, I have been taught at a young age to love any New England sport. Of course I have been trained to love my teams even when they are not doing so hot, lookin’ at you Bruins, but what has been most engrained in my New England sport’s upbringing is to always root against New York teams. This is obvious because the New York vs. Boston rivalry has always been a thing and something that has been perpetuated throughout the years. Nina and I took the rivalry to a whole other level. Shout out to Lauren Sears for the picture! 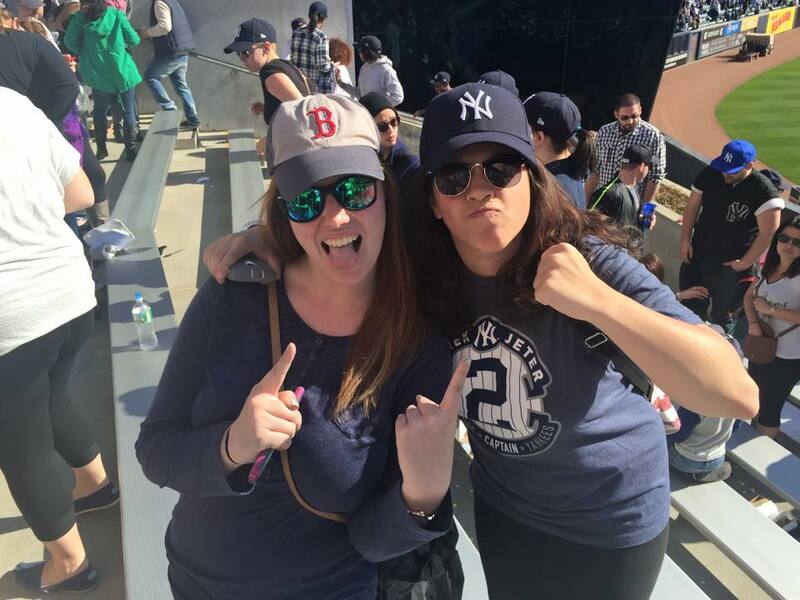 When I was signing up for the trip I obviously realized that I do in fact go to school in New York and because of this I knew that I would be outnumbered and essentially behind enemy lines at Yankee Stadium. 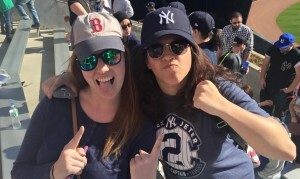 Despite this I boarded the bus to New York with my Red Sox hat on and a fake Boston accent (I have a much more subtle MA accent) to combat the NY fans- most of whom were my friends. Right as I settled into my seat for the three hour bus ride the smack talk started and I was ready to play ball (pun so intended). Thankfully, the Red Sox had won the first game in the series against the Yankees so I had some ammunition against the jokes about my team. Once we arrived at the stadium the group split up and I was able to adventure to a nearby deli with my friends as others went to find our seats. As my friends got delicious looking sandwiches I, much to the amusement of a police officer that was also grabbing some food, opted just for a deli pickle because I was saving my appetite for a hot dog in the park. With this in mind it is also important to note that I had never been to a professional level baseball game before so everything was exciting and I was trying to be as cliche as possible. After our bite to eat we went into the park and as we found our seats I could not stop remarking at how much smaller the stadium looks in person as compared to TV. Regardless of how small the stadium felt to what I was expecting our seats, despite being on the bleachers, were awesome and I found myself within feet of the Red Sox… and Yankees but whatever. As the game got underway the level of smack talk between my friends and I increased and tensions began to rise as I found myself in an expected sea of navy blue. 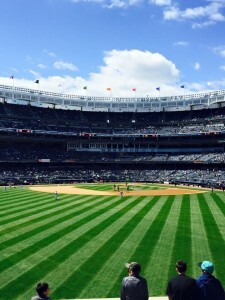 Just as the Red Sox started to gain momentum I also found allies in the bleacher section that would give me glances and smiles every time our boys did something favorable on the field. When the Red Sox took the lead my friends turned to my allies and told them to take me home because they no longer wanted me. I took this hostility as a compliment to my team because after all, we did win 8-4. With my team winning, the sun shinning, and all of the laughing I could not have imagined a better way to spend one of my last Saturday’s at Saint Rose. That’s exactly what I was thinking. I thought this whole blog was going to be about how she got free french fries. Baseball is the ultimate comfy sporting event to go to. Sit around with friends, eat, have a good time.